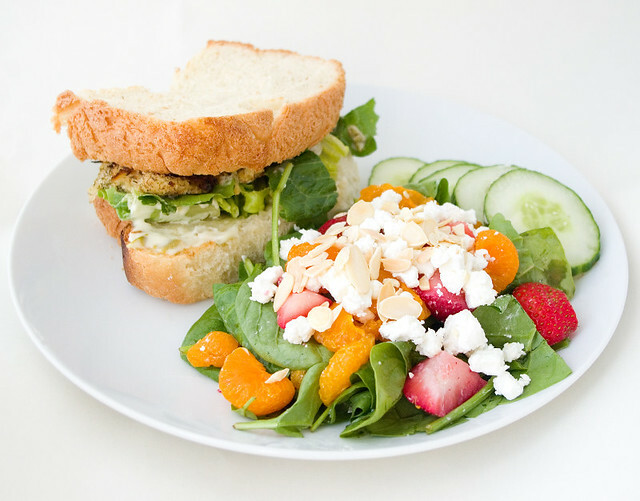 Dinner last night was a fresh and summery breaded cod sandwich served with a spinach and goat cheese salad. I’d love to say that this was due to a fantastic advanced planning, but it was mostly because I had picked up both the fish and the salad ingredients at 50% off because they needed to be eaten soon. Also, I’d been feeling like a fast food fish burger, but I thought I could manage something better at home. The cod was dipped in egg, then in a combination of dried dill and panko (Japanese bread crumbs), then lightly fried in a bit of olive oil. The bread was the lightly toasted basic white bread on page 14 of The Complete Guide to Bread Machine Baking from Better Homes and Gardens (1999). For a bit of additional flavour, I spread President’s Choice tartar lightly on one half of the bread, and for crunch I added some chopped romaine lettuce. This made for a lovely light sandwich that nonetheless was quite filling. The salad is based on one that I love to buy pre-made at the grocery store (when it’s on sale, of course), which is really easy to make at home. The base is baby spinach, which it topped with quartered strawberries, drained canned mandarin slices (the kind in pear juice, not syrup), sliced cucumbers, and blanched, sliced almonds. My favourite cheese for this salad is Woolwich Dairy Soft Unripened Goat Cheese Crumbles, which are much milder and creamier than most other goat cheeses I’ve tried. As a bonus, goat cheese doesn’t seem to upset my stomach, so yay for dairy I can actually eat! Posted on August 4, 2017 August 1, 2017 by owntwohandsblogPosted in CookingTagged dinner, fish, food, homemade, salad, sandwich, supper.